What shall I say... After 15 days without internet (due to the fact that the telephone company connected our line to a distribution box that was out of function. Nice one!) here's the next blow. This time, the HUGE and scary escavator bit the cable in parts. (And I'm sure you don't want to know that the same happened to the water pipes, yes, the sewage as well. Trust me, you don't want to know!) It's a comfort, to be able to handle things like personal hygiene and blogging somewhere else. By now, the trench is that deep and wide that I literally have to climb over the fence to the neighbour's garden to be able to reach the street again. Kind of thrilling, both in a rural-archaic way and in the attempt to bring home two huge filled bags from the spermarket. I feel like in this Asterix comic (Asterix and the Great Divide). You know, the one where the village is seperated by a trench and in the end they fill it with water and everbody lives happily ever after (except Troubadix, of course). I should work on re-uniting with the neighbours across the street by taking some showers and doing loads of laundry. But I think, you are already as tired of the constructions as I am. Let's see yarn! Or even better, let's see some pictures about having fun with yarn. 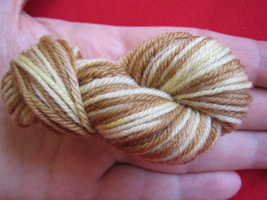 Last weekend, when I fooled myself into believing that I had plenty of time for idle yarn experiments, and I signed up for DYE-O-RAMA yarn swap. Having never ever dyed a thing, I registered at the WTF am I doing here group. Friday night, before 10 p.m. and confronted with this sight, I decided it is time to enhance my level of experience. What is a girl to do when the shops are closed and the next Kool-Aid stockist is a 5 hours flight away? Look around in your kitchen. 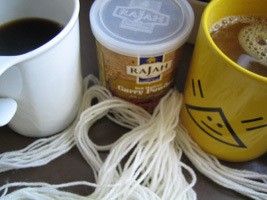 Sigga Sif dyed a fantastic latte-coloured yarn the other day - with coffee! 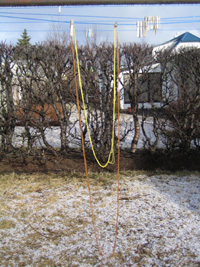 I ventured on self-striping yarn (performing some meticulous measurements according to this post) . Due to the fact that I had only some leftovers of white Lanett superwash and being honest, because I was too lazy to unwind a whole skein, this will only be a dye swatch. And well, 'stripes' demand for another colour. 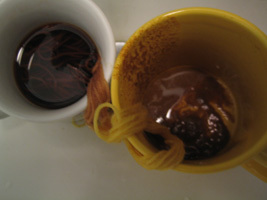 What fits to coffee and probably Project Spectrum's colours for April and happens to linger in my kitchen Friday night? Curry! 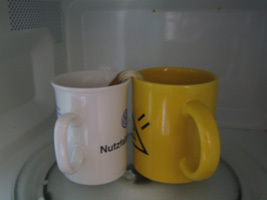 And off they go into the microwave. Okay, after pouring the water out, it didn't look like so much fun anymore! Curry is kind of not recommendable as a natural dye. At least from an aesthetical point of view. Next we have a piece of evidence of the drying process, and the snow, and a close-up of the colour result. Isn't this the cutest little hank of yarn? And this the cutest little centre-pull ball? It was so much fun however. For the dye-o-rama, I'm thinking about using up all the bad stain causing ingredients I have here in the house. Who needs Kool-Aid if you've got ink, curry, red wine, saffron, carrot juice, coffee, tea. No, I'm kidding. I might even try my hands on acid dye. But that's a decision that can well be postponed for some while. Dyeing rocks! 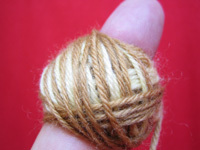 by Carola at 11:41 e.h.
And you are right, that is the cutest little skein of yarn ever! apríl 29, 2006 4:45 f.h. Brilliant! It truly is the cutest of all skeins. Reading your list, the mention of carrot juice intruiges me. Now I'm wondering if having a huge juicemaking machine is perhaps not such a bad idea after all! I can add paprika (the spice) to the list. I also thought about "sauce-color" (sósulitur), which I don't know if you can buy anywhere except in Iceland. At least here in Finland, the concept doesn't exist. Eeeek, this is so much fun! apríl 29, 2006 5:30 f.h. That is a very cute hank. It all looks so much fun but no fruity smell - coffee & curry instead!! How about beetroot??? That should make a great pink / red. apríl 29, 2006 5:42 f.h. Schöne Grüße, viel Durchhaltevermögen und viel Glück! apríl 29, 2006 7:44 f.h. apríl 29, 2006 9:14 f.h. Hey! I have the same curry powder, from the same company! You could try curcuma (Gelbwurz) for yellow colors; spinach should make a nice green, and of course beetroot for red/pink... I can't think of anything else right now. I hope they finish building soon! apríl 29, 2006 9:49 f.h. I'm with Julia...I think that turmeric would do a pretty decent job. apríl 29, 2006 12:22 e.h.
apríl 29, 2006 7:50 e.h.
Good luck with the natural dyeing methods. I'm just too laxy to even both with dyeing either way. 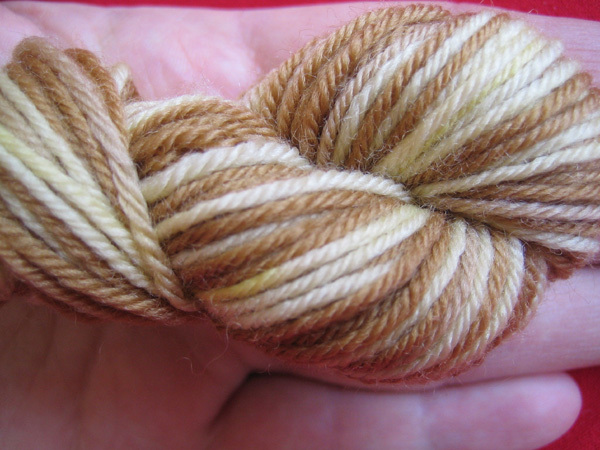 It will be interesting to see how your natural dyeing or otherwise works out, especially for your self-striping yarn experiment. Hope it all works out for you. I'll be watching. maí 01, 2006 12:39 e.h. 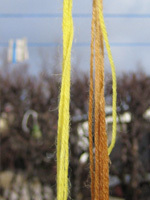 I used to have a book on natural dyeing, and I remember that onion skins were supposed to make a color, I think yellow. Worth a try -- everyone has onions!! maí 01, 2006 1:17 e.h.
i love the colors in your little itty bitty skein:) I am so in love with neutrals, it's a shame. maí 01, 2006 11:13 e.h.
gaaaaaaaaah! nooooooo! here i am staying as far away from yarn dyeing as humanly possible and you have to go post the cutest pictures of the cutest yarn dyed with the easiest ingredients. hmpf. maí 03, 2006 2:14 e.h.
Hi Carola! 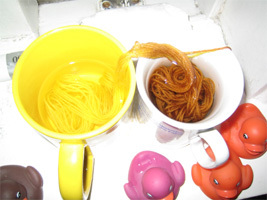 I just found out that you are my Dye-O-Rama yarn buddy! I will write again when I've dyed your yarn- I hope you'll like it! maí 03, 2006 7:59 e.h.